Today is my. last day at Worlds, with the women's final this afternoon. I'm flying home tomorrow morning so I'll be skipping the exhibitions. I've had an absolutely wonderful time, and I see no reason to think today won't be equally great. In a couple of hours, my cousin Fran is going to pick me up. We're going to a museum with an exhibit of movie costumes, plus lunch, plus the Neon Museum. Then she'll drop me off in time for the skating. Janet is taking a half day bus tour of LA, and Renee is meeting someone with whom she shares DNA (now that could be an interesting way for a serial killer to meet victims). Christy, who lives in LA, is most likely doing stay at home stuff this morning. We are all still speaking to each other, no small accomplishment in itself. 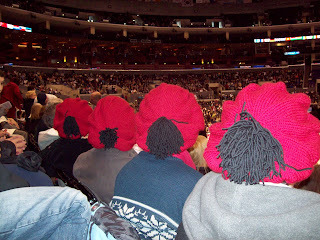 The skating has been great, and our seats, while with their own peculiarities, are celebrity magnets. Dorothy Hamill is practically a mundane experience at this point. Last night, we had Amber Corwin and Tara Lipinski sitting in the row behind us. Tara looked quite pretty. Renee, who is considerably less shy than I am when it comes to talking to famous people, asked Tai Babalonia a question (which Tai answered). And we had the loveliest time talking to a young skater who represents the Philippines. She didn't make the cut for the freeskate, but she was thrilled with her performance, and with people coming up to her to tell her how much they loved her skate and asking her for her autograph. To show what a good time I've been having, I'll post three pictures. 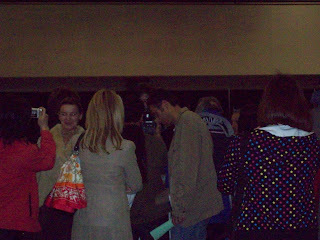 One is of people blocking my view of Brian Joubert. 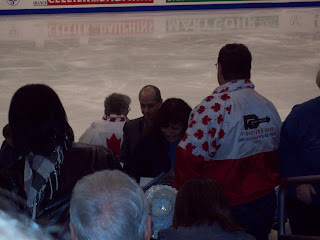 The second is of people blocking my view of Kurt Browning. And the third is Janet, Christy, Renee, and me. Except for the fact I'm going to be very busy this spring, visiting schools and libraries and attending library conferences, I intend never to leave my house again and to exercise 8 days a week and only eat sensible nutritious vegetables for the rest of my life. Good thing I have one more day of vacation to enjoy! Oh I bet that movie costume expedition is really neat! Be sure to tell us what costumes you see! I love the Museum of Neon Art. I'm glad you're having fun out here. We've had some beautiful weather for you this week, which, of course, you've spent in a cold skating rink. Hmmm. Enjoy your final day! Who was the best skater??? Do u know if Life As We Knew It will become a movie? ?